Wearing our tie-dyed NS&D shirts, some proudly wearing their vests, over 100 members gathered at the Baseball Grounds of Jacksonville to watch the mighty Jacksonville Suns take on the Mobile BayBears. The Suns won the game with a 9th inning home run. Shortly after the game ended, a wonderful post-game fireworks display seemed to go on forever. Then the real fun began. 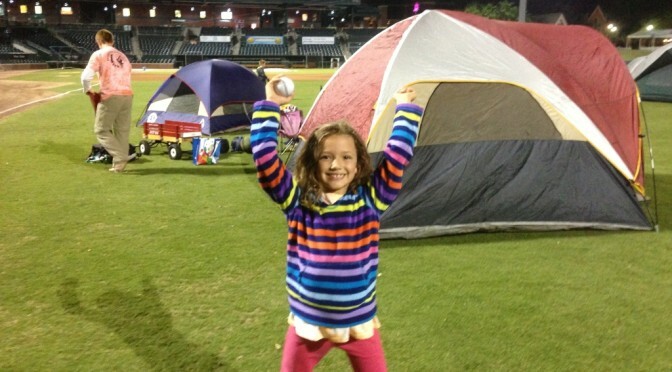 After the field was cleared and the fans had gone home, we gathered our tents, sleeping bags, and chairs, and waited patiently in the parking lot at the outfield gate. When the gates opened, we filed into the field along with approximately 100 boy scouts. We set up our tents (no stakes allowed) and relaxed in the cool, night air. Just about the time our busy setup activities had slowed, a baseball-themed movie titled “The Sandlot” started to play on the jumbotron. What a cool experience. Shoes and socks removed to feel the soft grass between their toes, the kids played catch with the baseballs handed out during the game. The movie ended just around midnight. The park’s lights were shut off leaving on a few lights on to move around safely. After a very short night of sleep, we woke to a bright sun. The entire field packed up and headed home, carrying with them a lot of memories. Truly a home run experience!